This sheet rack is operated electrically or with a crank. 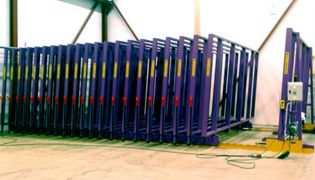 Searching for a mobile sheet rack with manual operation? 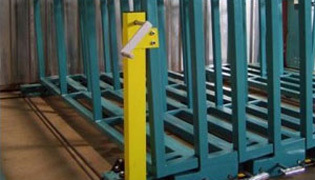 Then visit our page on mobile frame rack: manual operation. 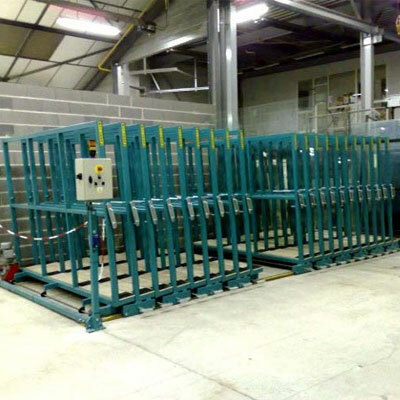 Fast and easy access to your metal sheets, rest pieces and other sheet materials. The electrical mobile frame rack is the most space-saving method when you want to store a bigger volume of heavy metal sheets. 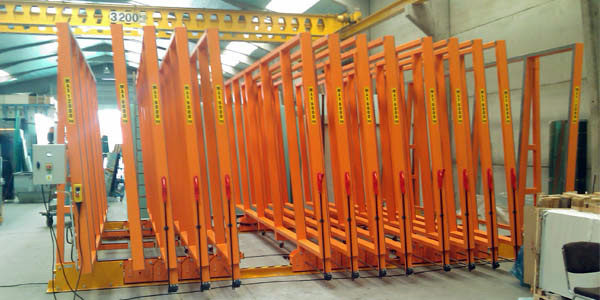 The mobile frame rack with automated electrical moving frames is compact and provides a good overview of all you metal sheets. The mobile frames are provided with wheels and a lever. By pulling the lever you can mark the position where the aisle should be created. 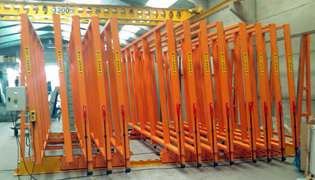 The mobile frames are positioned on 2 parallel rails. 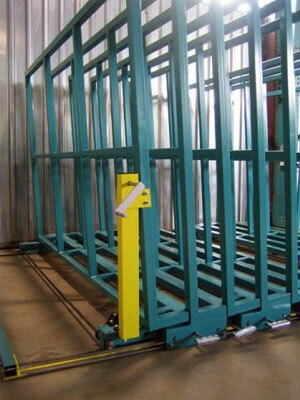 The moving mobile frames create an aisle for easy access to the selected metal sheet. It's a safe and secure handling method. - An entirely electrical system, where the frames slide open automatically after pushing the control button. 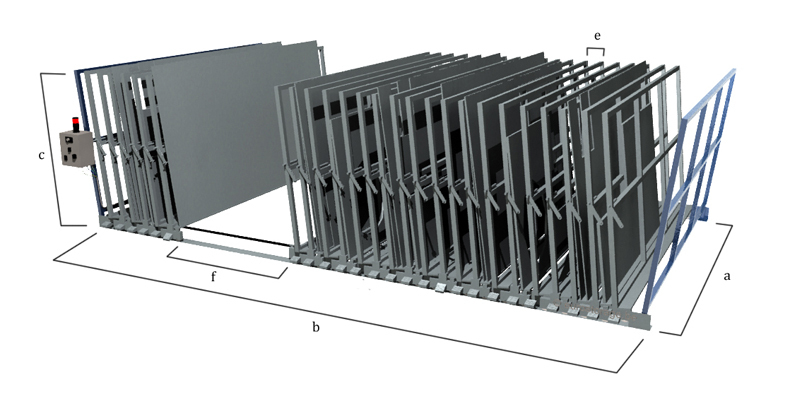 Light version : storage of sheet metal up to 4000 mm. 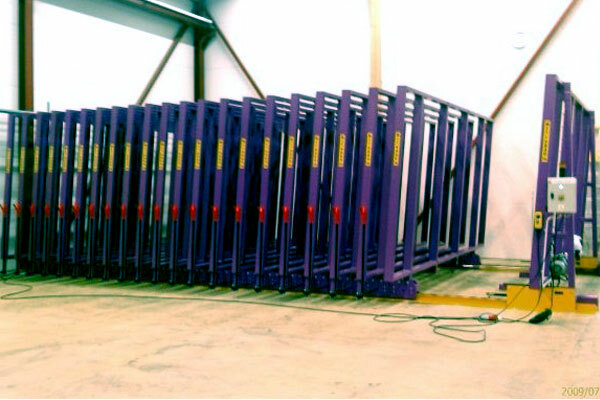 Heavy version : storage of sheet metal starting from 4000 mm. Every mobile frame is equipped with a treadle. When pressing the treadle and then the activation button, the frames will move to the end position. This creates an aisle at the position where the treadle was pressed, i. e. the selected position. 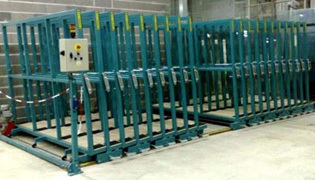 During this displacement of the frames, the operator can prepare for the handling itself. 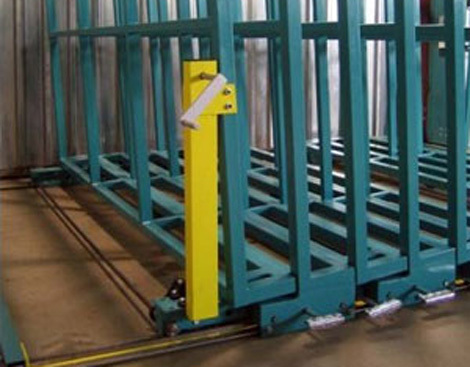 As soon as the operator enters the aisle, all frames will automatically stop moving, due to sensors. The handling can now safely and comfortably take place. Attention: if you choose a control with crank version, there is a maximum of 25 frames for 1 configuration! The hydraulic version works with a crank to move the mobile frames. The mobile frames move on 2 parallel rails and create an aisle at the position you have selected by pressing the treadle.The frames will move to the end position when you rotate the crank. Then you can safely enter the aisle for easy handling.